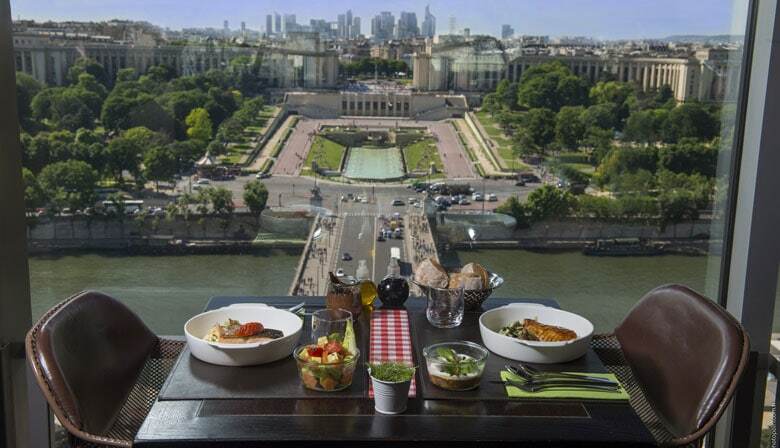 Enjoy a truly unique experience at the "58 Tour Eiffel" restaurant located on the first floor of the Eiffel Tower, with uninterrupted panoramic views of the Paris skyline: Montmartre and the Sacré Coeur, the Invalides, the Champ-de-Mars, the Champs Elysées and the Arc de Triomphe. You will live a unique moment at the top of the Eiffel Tower enjoying a superb view of Paris from the second floor and a pleasant lunch on the 1st floor. You will come to our agency PARISCityVISION Bourdonnais located close to the Eiffel Tower to remove your access ticket to the first and second floor of the most emblematic monument of Paris. Your priority access will allow you to avoid long and arduous queues. If possible, you will be accompanied to the 2nd floor by the elevator. You will contemplate a superb panorama to 115 meters of the ground drawing in the distance the great monuments of Paris. You will be able to distinguish the basilica of the Sacred Heart perched on the hill Montmartre, the incredible Tour Montparnasse, the Arc de Triomphe overlooking the most beautiful avenue of the World that is the Champs Elysées. You can fully enjoy this free time to continue your visit to the Eiffel Tower and go around to see the 360 ​​° view. Depending on the time of the climb, you will start either with lunch or on the second floor. You will receive your confirmation and your tour voucher in 2 separate emails. Present your voucher to the "58 Tour Eiffel" restaurant's desk between the North and the East pilar. This is a must for any visitor to Paris. What could be more Parisian than a 3 course French lunch served on the Eiffel Tower. Every course was delicious and the views from the restaurant will be a memory you will never forget. Don't leave Paris before experiencing this memorable lunch. My daughter and I were running late for our reservations (we messed up on the time change) and afraid that we would not be allowed to eat in the restaurant. The staff was lovely, we were seated downstairs (I think reservations are usually seated upstairs) and had great services, amazing food, and a remarkably memorable time! quick access, great food, great service, great views! First time in Paris and this tour allowed us to visit on our own and then we had a reserved lunch. The lunch was full service with delicious food. I would highly recommend this tour. Great excursion and it went very smoothly. perfect, go at 11:30 beucase no people and you can choose table near window :). 1st and 2nd floor of tower in price.